In the coming years, government bonds may not be the right defensive asset for protecting investment portfolios. Investors should consider and understand the characteristics of a variety of defensive assets in order to meet their objectives. Alongside geopolitical uncertainty and record-low bond yields, today’s investors are experiencing risk related to tax cuts, increased infrastructure spending, rebounding energy prices, a tight labor market, and the shift from deflation to reflation. Investors may consider a variety of defensive assets to address the components of equity risk, bond risk and inflation risk. Unfortunately there is no “one size fits all” option. Rather, the right approach is likely a combination of the following strategies that address the mix of risk factors underlying a portfolio today. Convertible bonds: This is a relatively small asset class that is often overlooked. Their hybrid structure means they can provide upside capital appreciation similar to that of equities, while maintaining the downside protection of fixed income assets. That said, much of the market is unrated, so investors should research credit quality and default risk before buying. Low-volatility equities: Diversifying some equity risk to low-volatility equities can provide some downside protection. This category includes not only minimum-variance strategies, but also quality strategies and variable-beta strategies where managers have the flexibility to move from equities to fixed income, cash or even gold. 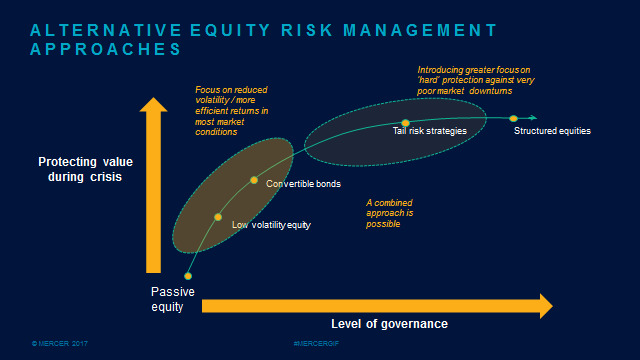 Tail-risk strategies: While the above are useful, neither will protect in an extreme scenario. Tail-risk hedging strategies are specifically designed to enhance returns during a tail-risk event. As such, they provide no participation on the upside. Under normal market conditions these strategies can be a drag to a portfolio’s return, but they do free up liquidity to buy assets at distressed prices immediately after a tail risk event. Structured equities: This encompasses tailored and complex solutions to help reshape the risk-and-return profile of equity allocations. Though they come with governance considerations, structured equities provide great flexibility in terms of the range of profit and the risk minimization outcomes that can be put into place.